In May 1997, Jeff Laser volunteered to help William O’Brien, Executive Director of the Great Lakes Historical Society, inventory some artifacts that were in storage. Jeff, a foghorn expert, had heard by the grapevine that the DeTour Reef Light foghorn was in storage at the Museum. The rumor was true and Jeff found the foghorn all covered in a layer of dried mud and severely rusted in a condition that looked beyond the possibility of being restored. Nevertheless, in February 1998, Jeff made an offer to try and restore the foghorn to operating condition. 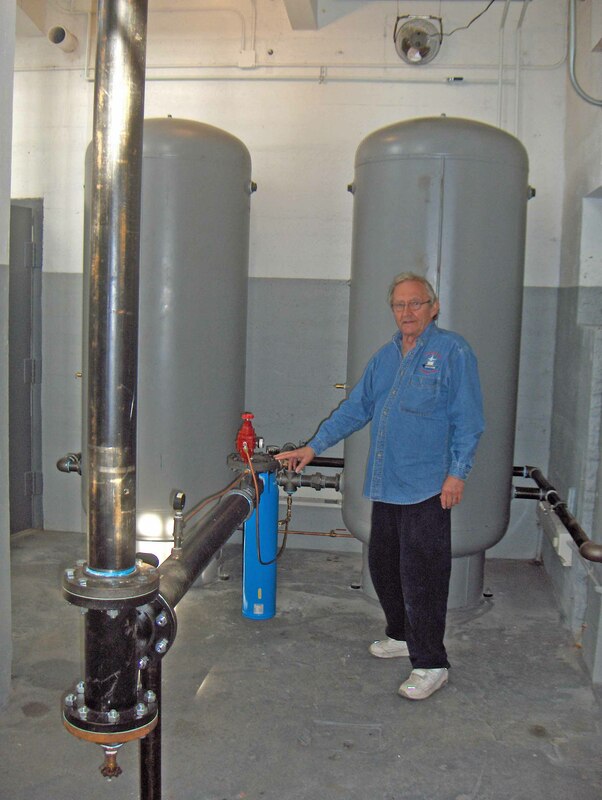 By chance, in April of 1998, he received a membership application brochure from the DeTour Reef Light Preservation Society (DRLPS) and decided to join the Society. Along with his membership fee, he informed us of the existence of our 1956 foghorn and sent us some historical and technical information on the foghorn. Jeff told us that if we could obtain the foghorn from the Inland Seas Museum he would be more than glad to try to restore it to operating condition. By August of 1998 we had convinced the Museum to sign the foghorn over to the DRLPS whereupon Jeff picked it up and began the restoration. On October 9, 1998, he tested the foghorn on the shore of Lake Erie at a private residence in Ripley, NY. It worked perfectly. He delivered the finished unit to the DRLPS at the Drummond Island Museum on June 6, 1999, where it was setup as a static display. 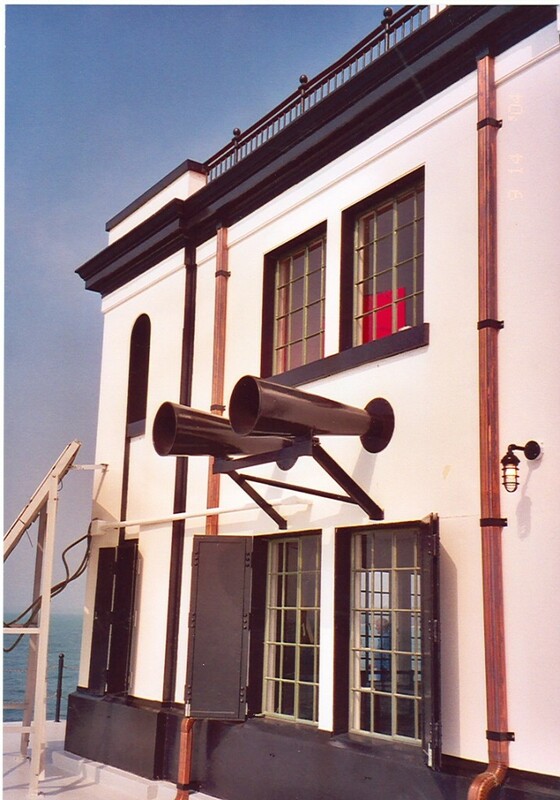 As part of a major restoration of the DeTour Reef Light in 2003 and 2004, the trumpet (or megaphone) from the restored foghorn was installed on the lighthouse (as well as a duplicate trumpet) which gave the DeTour Reef Light an authentic appearance. The F2T tone generator (the sound producing hardware bolted on the back of the trumpet) was not installed at that time. The return of the traditional foghorn sound at the DeTour Reef Light is the result of significant research, time and effort on the part of the DRLPS Historian, Chuck Feltner. 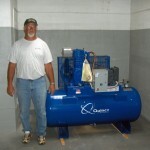 This complex project could not have been accomplished without Chuck’s engineering expertise. Based on Chuck’s inquiries to numerous lighthouse organizations and preservation experts around the country, we have concluded that the foghorn at the DeTour Reef Light is the only operating diaphone foghorn on a lighthouse in the United States. 2009, this responsibility was taken over by Chuck Feltner. The project required that an air delivery and control system be designed and built to supply the air to blow the foghorn. The design of the air delivery system was a bigger problem and more complicated than the DRLPS had anticipated. However, using information from USCG Aid to Navigation training manuals published in 1941, 1945, and 1953, we were able to determine how the F2T Diaphone functioned , and how to install, operate and maintain this foghorn. These manuals were provided by Jeff Laser. 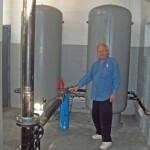 Given this information, we were able to design the appropriate air delivery system. 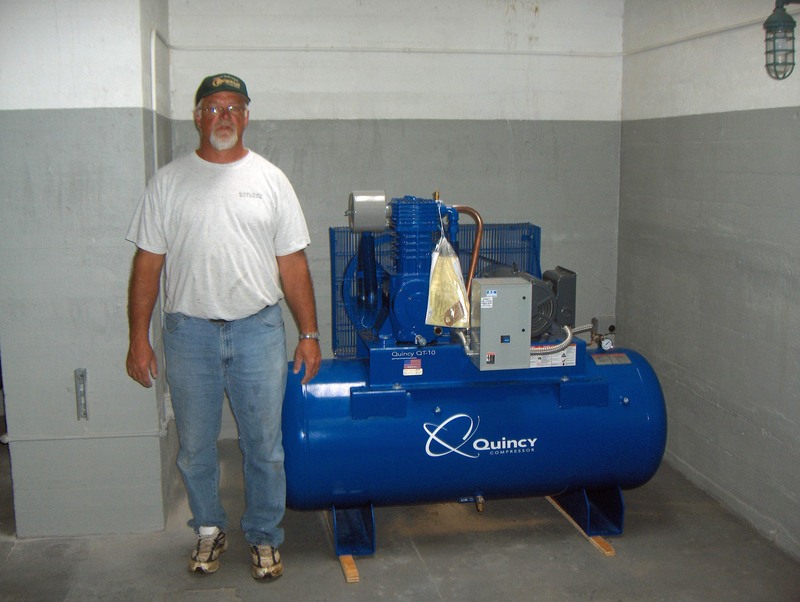 The project was completed at a cost of $52,000 in August 2010 by our contractors UP Engineers and Architects of Marquette, Michigan, and Mihm Enterprises of Hamilton, Michigan. The foghorn was first sounded on August 27, 2010 (the sound was awesome and deafening), and, in the future, it will be used for demonstration and ceremonial purposes. More information on the invention, development and operation of the Diaphone foghorn can be found in the informative and interesting article “The Diaphone Fog Signal” by Jeff Laser of Bellville, Ohio at http://www.terrypepper.com/lights/. This is the sixth matching fund award received by the DRLPS from the Michigan Lighthouse Assistance Program (MLAP) administered by the State Historic Preservation Office (SHPO). The Michigan Lighthouse Assistance Program is funded by proceeds from the sale of the “Save our Lights” license plate. Lighthouse grants are given to state and local governments or nonprofit organizations to them assist in the preservation, rehabilitation, and protection of lighthouses in Michigan. Recipients must provide 50 percent of the grant award as matching funds. The grant program arose from a concern about the disposal of over two-thirds of the lighthouses in Michigan by the U.S. Coast Guard and was established to assist in the preservation, rehabilitation and protection of these lighthouses.